Some of our best social media tips for dentists by a dentist! Whether you love them or hate them, there’s no denying the power of the hashtag. Posts with at least one Instagram hashtag average 12.6% more engagement than posts without a hashtag, so if you want to get more likes on Instagram and get on the Instagram Explore page (where people outside of your own network can find you and follow you), hashtags are essential. They are an absolute MUST when developing your dental marketing strategy. Instagram hashtags are the best way to get your Instagram posts (and your dental practice!) discovered by a new audience, and because you choose the hashtags you want to tag, you can target them to attract the right kind of patient. 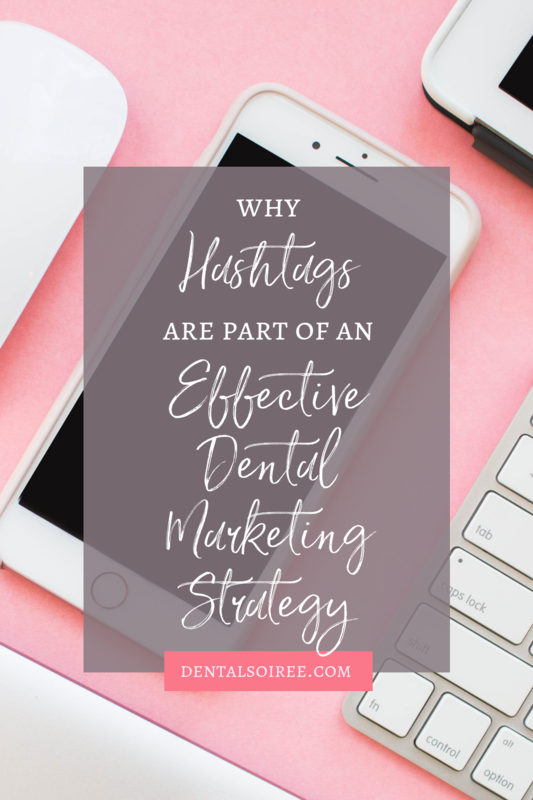 If your dental practice focuses more on orthodontics, you can target people looking for that kind of content using hashtags. Similarly with pediatrics, cosmetic dentistry, more high-end dentistry, whatever you want! Since hashtag research can take a bit of time and effort, it can be tempting to just add some common ones to your post and move on. But hashtags like #smile or #teeth are way too popular to be effective. You might think that because a lot of people use these hashtags, they’re good ones to add to your post, but that’s not automatically the case. Because so many posts have these general hashtags, your post will be buried minutes or even seconds after you hit the publish button. On the other hand, you don’t want to use hashtags that are too niche, either. Hashtags like #fundentistsinmiami probably don’t have any posts, so while you would be easily found if someone did search for that, the odds of someone typing in that exact hashtag are pretty slim… unless you start using it on all of your content and promote it as a branded hashtag for your practice. However, if you’re going to do that, you’re much better off using your dental practice’s name in the hashtag (more on this in a minute). Instead of using the most popular Instagram hashtags, it’s better to use the top Instagram hashtags for your industry that have an engaging community behind them and are specific to your audience. You can use Instagram’s search function to search hashtags you want to use. This will show you how popular the hashtags are. We have found that hashtags that have 10,000 – 400,000 uses perform the best. For example, #miamidentist might be a better one to use than #fundentistsinmiami because 19,922 people are using it. People are searching for it, but not so many people that your post won’t be visible in the top few spots for a while. This can be a time-consuming process, for sure. We recommend sitting down every few months to create a few sets of hashtags that you can mix and match with your photos. Unfortunately, Instagram does not necessarily “like” it when users attach the same exact set of hashtags to every post. There is a rumor out there that it actually causes your posts to be seen less, which is definitely not what you want. Be sure to switch them up and add relevant hashtags to each post. If you’re thinking all this sounds like way too much, you’re not alone. We hear this from dentists all the time! Building a dental marketing strategy is a lot of work, but having one is absolutely necessary for growing your brand and your business. If you’re looking for a shortcut, we can help! We offer a monthly membership over at our sister site, Soiree Stock. As a member, you will get unlimited downloads from our styled stock photography website. We create content specifically for dentists, so you’ll find lots of photos that you’ll love. You can use them on social media, on your website, your blog, whatever! In addition, we’ve recently decided to include the Soiree Bundle with all Soiree Stock memberships. The Soiree Bundle includes 30 social media captions and 30 researched and targeted hashtag sets each month. You can mix and match them, tweak them as needed, and post away. Your dental marketing strategy is literally as easy as copy, paste, post. Our memberships are affordable, and there’s no obligation. You can cancel anytime. If this sounds like it could be a lifesaver for you and your practice, you can get more information on the Soiree Stock website! Isn’t it really nice when someone gives you a shortcut? It’s especially great if that shortcut ends up saving you time, frustration, and money! If your dream is to become a successful dental marketing maven, you’re probably wondering what things you need to start doing. We understand, and we’d love to help you accomplish that dream! 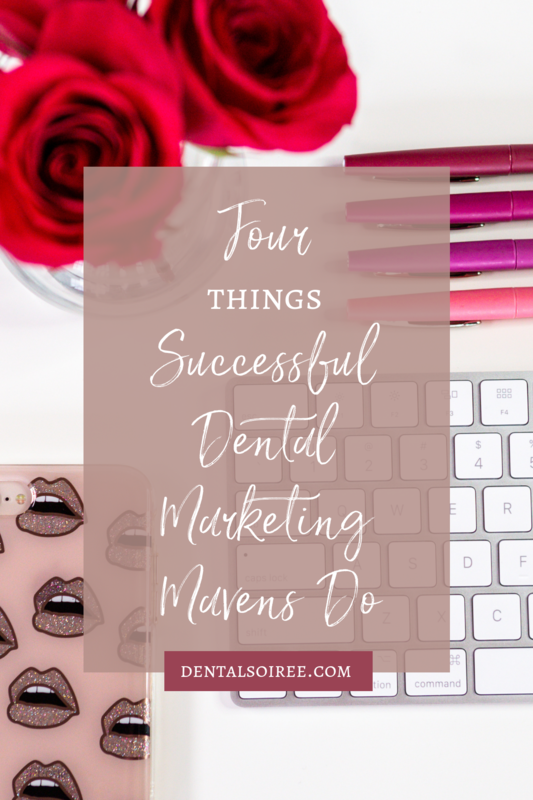 In this blog, we’re going to go over four of the big things all successful dental marketing mavens do. We hope it helps you as you work toward your big 2019 goals. Most successful dental marketing strategies involve a good amount of planning your work and working your plan. A content calendar is great for this. You can plan out which days you’re going to post content on which channels, you can map out larger marketing pushes based on seasonal factors, and you can plan launches of new services, programs, and even content series. When you sit down to come up with a marketing plan, we encourage thinking both short-term and long-term. 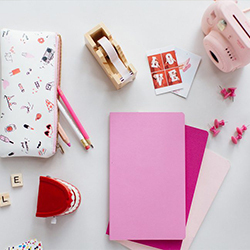 Get a little more detailed with your monthly calendar, but don’t forget to look ahead. If you’re planning something big in a few months, start working on the marketing now. This will help prevent a stressful situation later, and lead to much better results. What good is a plan if you don’t know whether it worked? Be sure to keep a careful eye on your analytics. Look at spikes (both positive and negative) and try to pinpoint the reason behind them. Adjust your plan constantly based on what you find. Just because you’ve mapped out what you want to do doesn’t mean you have to be married to it, especially if you’re seeing that something isn’t working. Successful dental marketing mavens don’t waste time and energy on strategies that aren’t showing good results. All too often, we see dental practices that connect all of their social media accounts so that when they post to one channel, it automatically posts everywhere else at the same time. It might be saving time, but that content isn’t optimized for the other platforms, and it’s probably not going to perform well. Take the time to create different versions of your content for different platforms, consistently post to your blog (it’s one of the best ways to build SEO and rank higher in search engine searches) and send emails to your list. Creating content your patients and potential future patients want to see is the best way to find success. Hitting “post” on your latest piece of content may feel like the end of the story, but it’s not. Social media is social, and if you’re not checking back to engage with people who comment on your posts or send you messages, you are going to get left behind pretty quickly. People prefer to interact with brands that engage. Not only that, social media algorithms favor accounts that have good engagement and will show your content to more people, both in and out of your network. It takes a little bit of time, but it’s worth it! Do you have questions about building a successful dental marketing strategy? The team of mavens at Dental Soiree would be more than happy to help; just click here to send us a message! At Dental Soiree, we are ALL about getting amazing results for hard-working dentists. We are owned and run by a cosmetic dentist, Dr. Jessica Emery, so we know first-hand how challenging it can be to stand out from the crowd on social media. Dentists are absolutely necessary, but they’re often not the most exciting accounts to follow online. That doesn’t have to be the case! We love creating gorgeous imagery and engaging content for dentists, and our dental marketing packages get great results for our clients! Our most popular dental marketing package is our Socialite package. 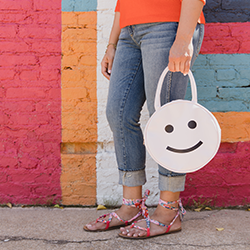 This is our full-service creative branding package and it includes a full day photoshoot in Chicago where we create branded photography for your practice! We do your hair and makeup, gather customized props and help you develop a social media strategy. We’ve also traveled to other cities to do photoshoots in some of our clients’ hometowns! It’s so fun to give people the full soiree treatment and deliver several months’ worth of content that they’re able to use to instantly transform their online presence. So What Do Our Clients Think? Working with them is one of the best decisions I have made. Dental Soiree is ahead of its time. Let’s Talk About YOUR Dental Marketing Goals! 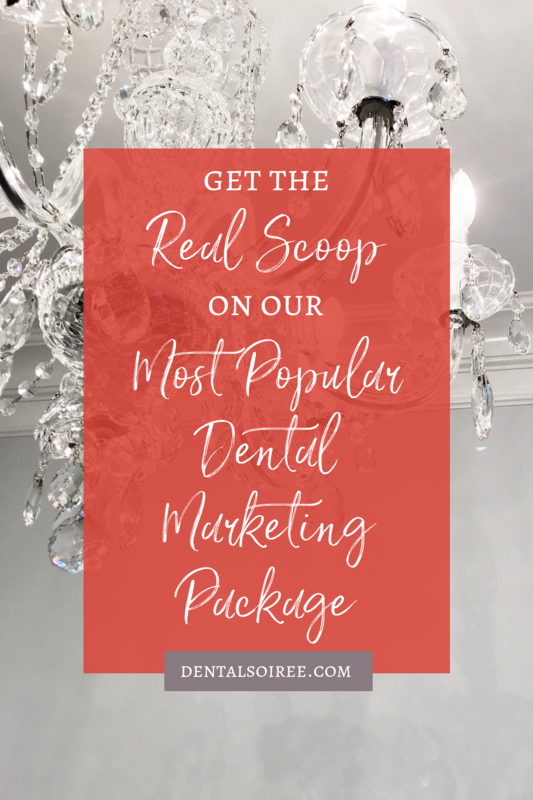 Want to experience the Socialite dental marketing package for yourself? We’d love to chat about it and create a custom experience for you! You can contact us here and we can have a no-pressure conversation about the investment and timeline for this package. Every day feels like a holiday when you’re in the dentistry field. But, did you know there really are holidays all the time that we can highlight on our social media pages to get more engagement? 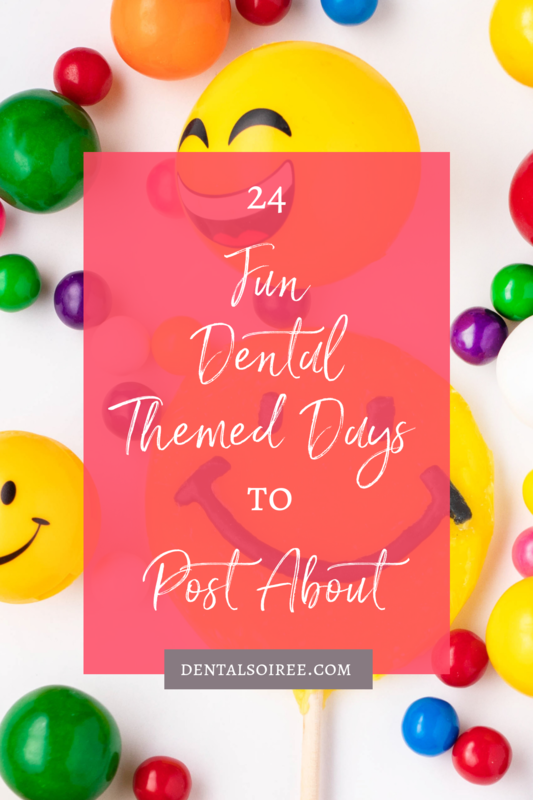 We’ve collected some fun dental-themed days that you can create content for and spread a little extra joy on your feeds! Most of these dental-themed days are U.S. holidays, but a few of them are international. Depending on where you are in the world, some or all of these may work for you. Feel free to bookmark this list so you can revisit it each month as you plan your social media content! Okay, are you ready to have some fun? 3 – National Drinking Straw Day – Talk about how straws and healthy teeth are BFF.! 28 – National Have Fun At Work Day – Show some behind the scenes photos of your team having fun! 9 – National Toothache Day – There’s lots of things you can do on this day! 28 – National Tooth Fairy Day – Share a fun fact or personal story about the Tooth Fairy. 29 – National Mom and Pop Business Owners Day – Are you a small, privately owned practice? Celebrate that fact on March 29! 11 – National Pet Day – Our pet’s teeth matter, too! Share a tip or fact about oral care for animals. 27 – National Tell a Story Day – Use this day to tell a story about you, your practice, or you could even share a cautionary tale about tooth care. 8 – National Receptionists’ Day – Shout out your amazing receptionists today! 15 – National Smile Power Day – This is a day for everyone to share the power of the smile! 21 – National Selfie Day – Yay selfies! Ask your followers to share selfies featuring their beautiful smiles today. 12 – National Simplicity Day – Share a tip with your followers to make their oral health routine simpler! 29 – National Lipstick Day – Pucker up! Share your favorite lipstick shade, or your tip for keeping lipstick off your teeth! 16 – National Tell a Joke Day – There’s some great jokes about teeth out there. Share one on your feed! 21 – National Senior Citizens Day – What are some dental tips related to seniors that you could share? 28 – National Good Neighbor Day – Do you have any neighbors that you want to call attention to? Today’s the perfect day! 30 – National Chewing Gum Day – Share your wisdom about chewing gum with your followers. Give them tips to choose the right gum for good oral health! 16 – Boss’s Day – This is a great day to shout out the bosses that help your practice run smoothly! 1 – National Brush Your Teeth Day – Remind your followers to brush away those sugar bugs from Halloween! 23 – Flossing Day – The day after Thanksgiving is a great day to focus on the habit of flossing. 7 – National Cotton Candy Day – Cotton candy, also called candy floss or fairy floss, was created by a dentist! 26 – National Thank You Note Day – Use social media to send a virtual thank you note to your patients! Need a little help managing your social media accounts and/or creating content for these dental-themed days (or any day, for that matter!) that makes people stop scrolling and pay more attention to your practice? We can help! Contact us to learn more about our social media management and branding packages! Hashtags. They’re the bane of many social media user’s existence! It seems like the rules are constantly changing around how to use hashtags. We often get asked if they’re really worth all the extra effort. In our opinion, they absolutely are! We know the process of finding and adding hashtags to your posts can add more time to your already busy schedule, but they’re the most effective way to get your content in front of the right people. In fact, on channels like Instagram, it’s one of the only ways to show up in new people’s feeds. 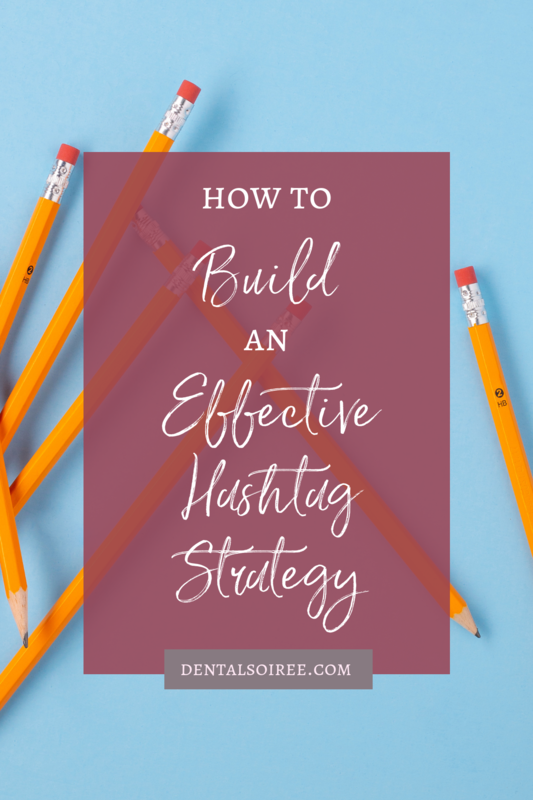 If you’re investing in social media marketing or spending a good amount of time doing it yourself, a good hashtag strategy needs to be a part of it. Instagram hashtags connected to your photo will be added to their highly targeted tag page, where other people with the identical hashtag will be able to find the photo more easily. On Twitter and LinkedIn, the pound sign turns any word or group of words that directly follow it into a searchable link. This allows you to organize content and track discussion topics based on those keywords. For example, if you’re posting a before and after photo of a whitening treatment, you could use the hashtags #teethwhitening or #whiteteeth so people can easily find your post. The most complicated part about building an effective hashtag strategy is choosing the right hashtags for your content. After all, what good is throwing a hashtag on your post if no one ever searches for that hashtag? Unfortunately, there’s no centralized list of good hashtags to use. That would be amazing! The truth is, hashtags are influenced by trends and change all the time. Certain hashtags surge in popularity while others fade into obscurity. You have to put in a little work upfront to come up with a list of hashtags that are timely, popular, and relevant to your content. In a past blog post, we discussed a few ways you can research hashtags. We strongly encourage you to pop on over and read the post. Developing a good hashtag strategy isn’t overly complicated, but it can be time consuming. However, we urge you not to skip hashtags. They’re so effective and helpful when it comes to broadening your reach on social media. If it seems like something you don’t have time to do, hiring a social media management team is a great idea. They can do all the work for you, and you can focus on the day-to-day demands of running your dental practice. If you decide to go this route, we would love to discuss our packages with you! You can contact us anytime and we can chat. We promise, there’s never any pressure or obligation. We’re a few weeks into the new year… how are those goals coming along? Are you still holding strong or did life already get in the way of your ambitious dreams for the new year? For those of you who had goals of really knocking your social media numbers out of the park in 2019, you might be finding that it takes a little more time and effort than you have available. That’s why outsourcing your social media management makes SO much sense! So often, we shy away from the idea of outsourcing aspects of our business. We think we can just handle it ourselves or train a (often already stretched-too-thin) team member to handle the task. Maybe it works well for a week or two, but then other things come up and soon, the task is forgotten. If your goal is to find more patients through your Facebook, Twitter, or Instagram channels, we urge you to consider the benefits of outsourcing your social media management! Sometimes, people are concerned that when they hire someone to handle their social media management, they’re relinquishing all control over the content and the look of their feed. Not the case! The right team will work collaboratively with you, but not in a way that is overly complicated or a drain on your already limited time. There is an onboarding period that usually lasts a few weeks where you’ll be working more closely with the social media management team. You’ll get a chance to see the content they’ve created and give your feedback. 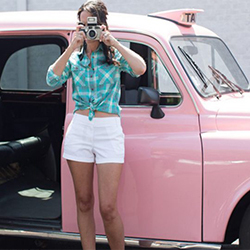 They may work with you to do some custom photography that will be a part of your social strategy. They’ll also need access to all of your brand assets like logos, color codes, and other graphical elements you’d like included in your social media feeds. After the onboarding period, your role will be much more “hands off” and you’ll mainly focus on overseeing the feeds and providing feedback and guidance as necessary. Another common concern when it comes to outsourcing social media management is whether the investment will pay off. How will you determine success? What kind of ROI can you expect to see? These are all great questions to ask your potential social media team. Most companies have a set process for delivering analytics and outlining social media success, but the more specific you are about what you expect to see and how you want the information delivered, the better. Of course, you’ll want to be realistic about your expectations. You aren’t going to be able to increase your followers by tens of thousands without spending a little money on advertising (most likely) and there’s always going to be an ebb and flow to your growth. Even if you lose a few followers or your engagement drops a little bit in the short term, looking at the long-term analytics will show a steadier pattern. If that shows growth, your team is doing something right! The Soiree Squad is Here to Help! 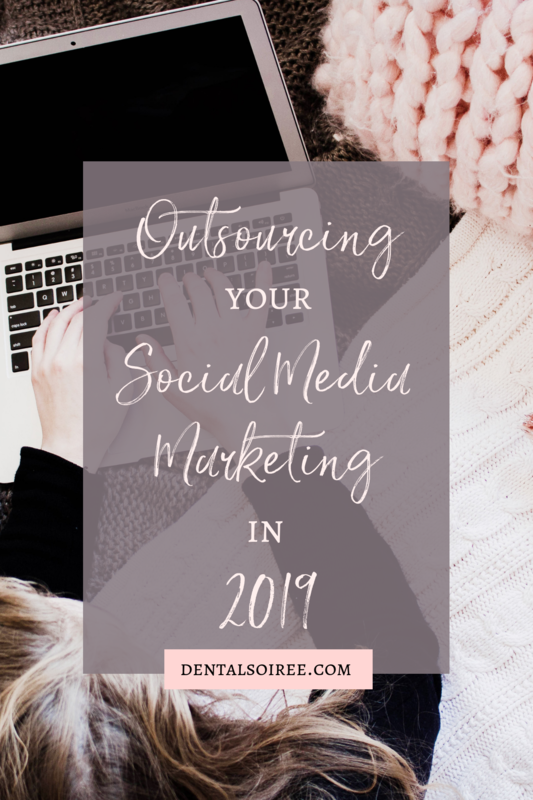 If you think outsourcing your social media management is the best way you can meet your goals, the Soiree Squad is here to help! 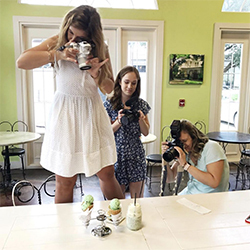 In addition to our #famous creative branding photoshoots, we also offer social media management for dental professions who want to grow bigger in 2019! If you’re interested in learning more about this service, you can fill out our contact form and someone will be in touch with you shortly!